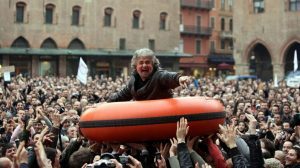 Banned from state TV and shunning the Berlusconi media empire, Italian comedian and political activist, Beppe Grillo, turns to the streets and the internet to fight political arrogance and corruption. His popular protest movement, Movimento 5 Stelle, vows to send all politicians home and bring the people to power. They win a stunning 25% of the vote to become the single largest party in Italy, and send 163 ordinary people into Parliament.